The original bag doesn't have the little leaves behind the flower. On Facebook some crocheters made a pattern of their own. I as well was smitten by this bag, so i gave it a try myself. This is what i came up with. The flower in the original pattern has 6 leaves, the other pattern has 8 leaves. The flower is made like an Irish flower, where the petals are crocheted on a chain behind the previous petals. In my experience the chains usually are too long, they create a rather large gap, so i reduced the number of chains by 2. The leaves are crocheted the same way, behind the petals. Because the gaps in the flower always will be there, i sewed them together at the back. It doesn't show in the front, and it effectively closes the fabric. Making the same kind of chain round for the start of the big circle. I introduced another thread of yarn, when i started the circle, crocheting single crochets over the second thread, like in tapestry crochet. The goal is to create a fabric, that doesn't need lining. If you do use a second thread, pull it regularly, preferably after 10 or 15 single crochets, because it tends to bulge a little in loops. The original pattern is made of clusters and 2 chains, but again, too open to my liking. I changed to bubbles. First round: 1 single crochet, 1 bubble of 5 double crochet, 2 single crochet, 1 bubble, 2 single crochet, ending with 2 single crochet. Second round: (wrong side) single crochet in every single crochet and bubble. Third round: 2 single crochet, 1 bubble, 2 single crochet, 1 bubble, ending with 1 single crochet. Fourth round: single crochet across the round like the second round. In this part of the bag i used the second thread as well, simply crocheting the single crochets and bubbles over the thread. This gives a very tight and closed fabric. The same principal of tightning regularly! The handles in the original pattern are tubes, which are filled after finishing. My fear was, they would be too heavy. I chose to make a simple handle of single crochet rounds, lenghtwise. Again crocheting over the second thread. This is a very good idea, because this will prevent the handles from stretching too long when the bag is used. I made a phototutorial on how to attach the handles to the bag. This also can be used for other bags. The order of photos is from top left to bottom right. Photo 1: The handle is sewed onto the bag, slightly lower then the edge, in order to spread the pulling force. Start at the place where the needle is placed. Photo 2: The back, the handle is sewn only on the sides and bottom. Photo 3: Crochet at the wrong side a surface chain under the 2 loops of the last round. This way you create 2 sides to crochet onto. Photo 4: When you get to the handle, push the hook through both the handle and round. Photo 5: This is how the chain on the back of the handle looks. Photo 7: At the end of the round, pull the working loop through the first loop of the round to the back, chain 1, crochet single crochet on the back of the 2-in-1 round. This is the front of the work, but it's crocheted behind the handle. Keep crocheting single crochet rounds over the second thread. Photo 8: This is how the attachment of the handle on the back looks like. Photo 9: And here's the front. There is a nice and almost invisible connection. Chain 20, slipstitch in the 9th chain from the hook, slipstitch 3 more chains, slipstitch in the 1st chain. Chain 1, crochet in the circle: 1 half double crochet, 6 double crochet, 1 chain, 6 double crochet, 1 half double crochet. Single crochet in the next 4 slipstitches, in the next circle 1 half double crochet, 6 double crochet, 1 chain, 6 double crochet, 1 half double crochet, 4 single crochet in the other side of the slipstitches. Close with slipstitch and fasten off. I embellished the 8 figure by crocheting a round of surface chain stitches around. Start with a magic circle with a very long tail. You will need it for sewing the button on. Crochet 10 single crochet in this magic circle, close with slipstitch, crochet 13 single crochet OVER the first round, close with slipstitch and continue with a surface chain round under the 2 loops of the previous round. Slipstitch and fasten off. Here is the end result. I'm quite proud of my bag! Very beautiful and great tutorial ! The flower at the side is simply gorgeous ! And I do like the texture of the bag. Exultant work and design is wonderful, great talent! oh WOW!! 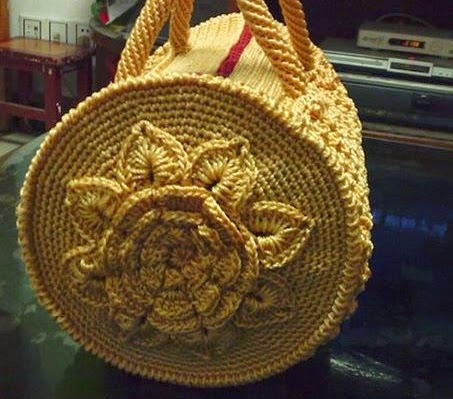 you are really talented and the bag is BEAUTIFUL!! Thanks you for taking the time to share your project, the details and the photos..it is very nice of you!!! You are very welcome Anna! Es freut mich, das Sie etwas uas mein Geschichte ubee die Tasche bekommen haben! 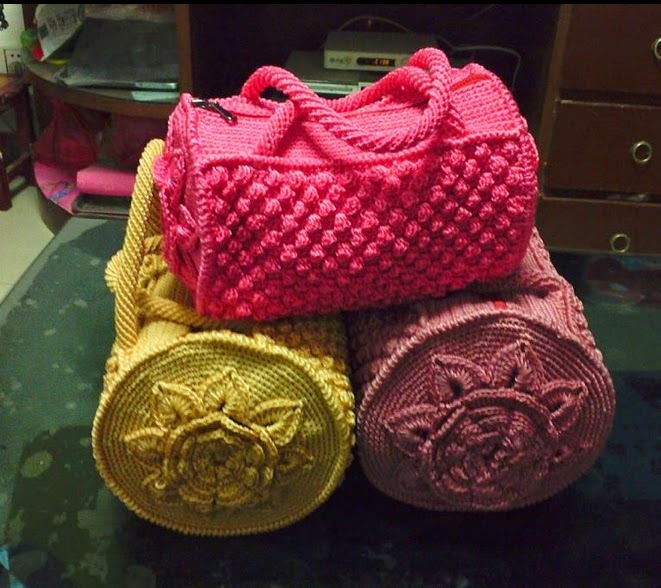 My pattern is not available, but the original bag is called Mermoz round bag, if you google that, you'll find it for sure! BREATHTAKING!!! Thank you so much for sharing! Outstanding! I don't understand this part "I introduced another thread of yarn, when i started the circle, crocheting single crochets over the second thread" . Is this the same as when you are changing colors and instead of dropping the yarn you carry it ??? Yes indeed, you carry the thread. If I was to make one could I sell it? Yes you can, because the pattern isn't mine. How did you make the leafs? But before and after the leaf I think is confusing me. And how did you make this loops? @Jaunty Jo, I don't exactly understand what you mean... but the leaves are crocheted in 2 rounds, the first is set up like the irish flowers in the back of the leaves of the flower, 1 sc around the base of a leaf, ch 2, 1 sc in 2 backloops of the corresponding leave from the previous round, ch 2, 1 sc in the sc between the 2 leaves, ch 6, 1 sc in the same stitch (this will be the heart of the leaf). Repeat this till the end, close with 1 ss in first sc. Next round ch 1, 1 sc in the same stitch, 6 dc in the loop between the leaves, ch 3, 6 sc in the same loop, 1 sc in the next sc (round the base previous round),6 dc, ch 3, 6 dc in the next loop, 1 sc in the next sc. Repeat around, finish with 1 ss in the first sc. The circle behind the flower and leaves is starting the same way, with 1 sc around the base of the leaf, 2 ch, 1 sc in 2 backloops of the corresponding leaf, 2 ch, 1 sc in the next sc, repeat. The next rounds you fill the chains with sc over a thread, which is described above. I hope this helps! Oh thank you. I tried something diffetent and it worked out pretty well. :) at the moment I struggle a bit with the bubble stitch from the original pattern. 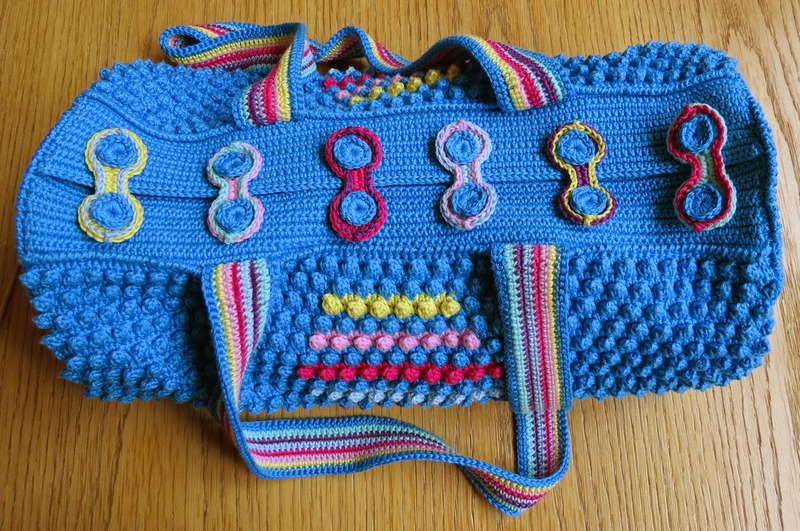 Am I correct in thinking that the main part of the bag can be crocehted flat, in my own preferred stitch, and just needs to line up with however big I want the circles on the end to be? Could it be that simple? Your bag is beautiful, truly beautiful. Thank you JulieLinn:) and yes it is that simple. I made mine big enough to carry 40 cm knittingneedles, but you can choose any size. Thank you it is beautiful! I will be starting on making one. Ask for help on the Mermoz bag. I am just wondering where you are saying " 2 single crochet, 1 bobble 2 single crochet '1bobble are the 2 singles and 1 bobble in the same stitch ? Hi Joan, if i remember correctly, the single crochets and bobble stitch are individual stitches. Beautiful! 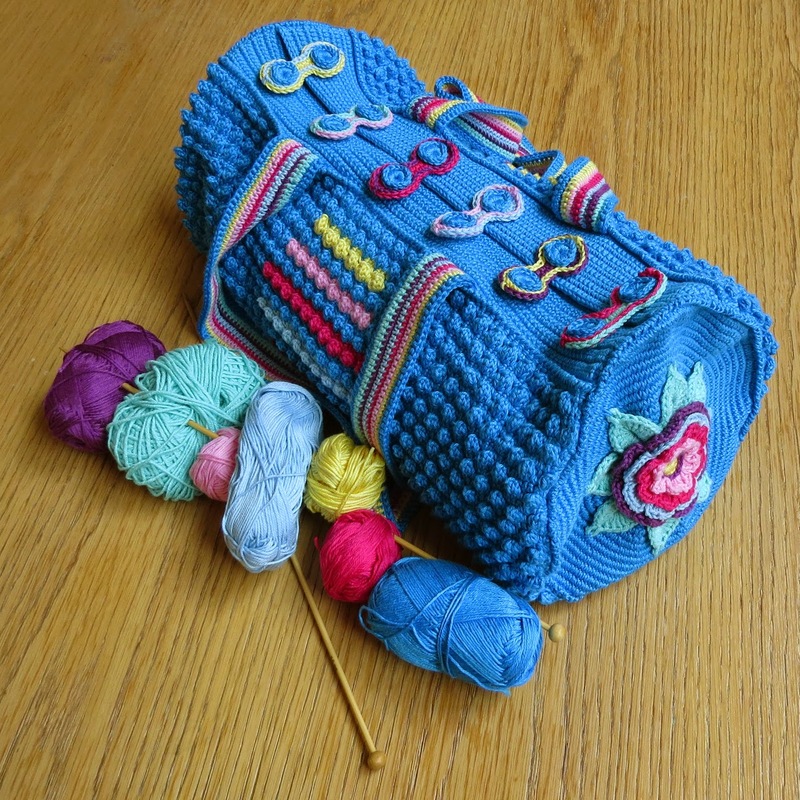 What yarn and hook guages did you use? The hook i used was 3 mm, and the yarn left over, but suited for that hook. I found it...thank you again! What are the dimensions for this bag? Hi, sorry for the delay, but here are the dimensions: the popcornstitch part is 42 cm wide, and 20 cm high, the bottom is 11 cm high, the top part is 2 x 5.5 cm. The circle is app 22 cm. The shoulderstraps are 68 cm. Just love your bags, great job. Beautiful!Thanks for sharing. God Bless you. how can i get the pattern for the mermoz round bag please? Hi Mary, i can’t tell, you since i sold it, but big enough to fit a rolled beachtowel. I am not experienced enough to understand how to read the diagram. Is there a written-out pattern anywhere for me to follow? I LOVE THIS BAG. I want to make it asap!!! Thank you Tammy, but the pattern is not my design, i wish i knew who did design it! you should be very proud of your work... it is unusual as well as practical... you also know how to write instructions clearly.. thank you so much for sharing this lovely bag pattern! Thank you for this huge compliment, Carol! What a beautiful bag. I'll be making one for myself and I'm sure when she sees if my sister will want one too. Thank you!